Predictions are good for this year’s Cherry crop in Oregon (apparently there are experts who can predict this kind of thing based on everything from the weather to pollination patterns). While this has ice cream sundae fans jazzed, it should also strike a chord with everyone else in Oregon (even if you prefer your dessert sans-fruit). 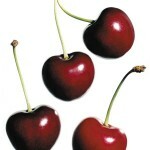 Lot’s of cherries means farmers will make more money and give a boost to that entire industry. BUT, it will also mean those farms have to hire more people to get the fruit from the trees to your tummy. That means lots of new jobs for local people.